The occassional burst of fireworks thumping faintly off in the distance last night reminded me that though in Japan we had already celebrated New Years 3 weeks earlier- in accordance with the Gregorian Calendar ( as the Japanese have been doing since 1873), it was only then, on Feb. 23 ( this year), that the New Year had begun according to the Chinese Calendar- which the Japanese had followed for more than a thousand years. 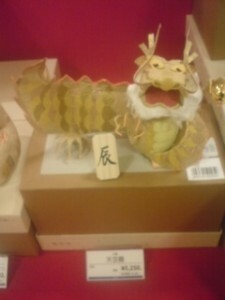 It was not until that moment, when I heard the Chinese residents of Tsukuba and the surrounding area out celebrating, that I truly felt that the Year of the Dragon had arrived. Let me tell you why I felt that way ( before I get into the fascinating ( and surprisingly complex) story of the role of DRAGONS in Japanese civilization). Many centuries later, during the Han Dynasty (206 BCE – 220 CE ), each of these 12 units came to be asscociated with a specific animal. Some scholars suggest that this occurred possibly because of the influence of the Greek zodiac, which the Chinese might have come to know via India. But no matter how or why a set of animals came to represent each of the twelve units, this concept has added plenty of symbolic depth (and appeal) to the system, since the unique characteristics of each of these animals could be used for fortune telling ( not unlike the astrology which developed in Europe- except for the fact that in the Chinese system everyone born in the same year has the same sign!). 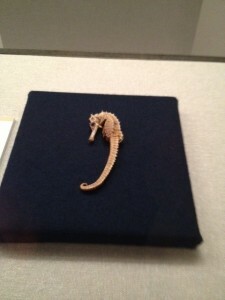 Also, quite importantly, artists and craftmen had these different animal motifs (so rich in possibilities) to work with. Since in days of old Japan was influenced by nearly all things Chinese, it is only natural that this system used for designating years, months, days, time of day, and directions was adopted by the Japanese. This happened officially during the reign of the Empress Suiko in the early 7th century. Over the subsequent centuries, this system- called ETO (干支), or JU-NISHI (十二支) in Japanese, gained terrific popularity ( because of the fortune telling AND decorative opportunities I have already mentioned)- especially in the Edo Period (1600-1868). Even after the Japanese abandoned their old ( Chinese) calendar and started using the Western (Gregorian) system, they have still clung firmly to the Chinese Zodiac.In fact now, it might be more to be more popular than ever. Starting from December each year, anyone living in ( or visiting Japan) can see an amazingly clever array of designs featuring the next years ETO animal on sale at stores or stalls, as figurines which will be displayed in homes, shops and offices for the entire following year( and then even more variety- because so many people create them themselves)- when New Years cards arrived, mostly emblazoned with home-made renderings of the year`s representative animal. ( For the sake of brevity I have simplified my explanation of this system which besides the use of the 12 zodiac sign also applies an additional ten stems and five elements- but FEW Japanese are familiar with these today- search for: JIKKAN JUNISHI, for more details). The twelve Junishi animals as recognized in Japan are: the mouse , cow, tiger, rabbit, dragon, snake, horse, sheep, monkey, rooster, dog, and wild boar ( which is a pig in the original Chinese set). 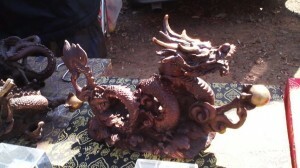 This year, 2012, as I have already mentioned, is the Year of the Dragon. And now that I have explained the history of the use of the zodiac in Japan, you can probably understand why I didnt feel like the DRAGON HAD ARRIVED until the coming of the traditional Chinese New Year. L ike me, you might find it especially curious that DRAGONS, imaginary creatures, are included as part of the traditional oriental zodiac, which is otherwise made up of very real, and mostly COMMON animals. Well, over the last few weeks I have been doing alot of thinking ( and studying) about this. Not only have I found a reasonable explanation for WHY dragons evolved in the human imagination and have become important figures in various world cultures, but I have also come to realize that the way dragons have been viewed in Asia ( as oppossed to the way they are viewed in Western societies) is extremely revealing in terms of undertanding the differences between these two cultural spheres. How did dragons come to capture the human imagination? Well, it is of importance to note that the belief in dragons developed among the peoples of the early AGRICULTURAL CIVILIZATIONS which arose along great rivers- especially the Tigris and Euphrates in Mesapotamia, and Yangtze and Yellow Rivers in China ( as well as the Indus Valley Civilization in India and Egyptian Civilization along the Nile). Among all the extant prehistoric depictions of animals left behind by our HUNTER-GATHERER forebearers in Europe, Africa, and elsewhere, there are no creatures to be found which resemble anything like what we would call a dragon. These early (pre-agricultural) artists always depicted REAL animals-which were in fact their prey. The first dragons drawings and carvings eventually appeared ( as I have already suggested) in the great river valleys where large scale agriculture first arose. In these societies, life and death could be determined by the behaviour of these powerful rivers. Flooding often meant calamity. It seems that the people of these ancient civilizations came to believe that it was DRAGONS ( or snakes, in the cases of ancient India and Egypt) dwelling in these rivers which controlled the flooding ( or lack of flooding). It is possible that this belief came about as the result of the discovery of DINOSAUR fossils which were revealed after flooding had subsided, ( even here in Tsukuba, fossils- for example that of a primitive relative of the elephant have been discovered on riverbanks). Monstrous remains which could only be satisfactorilly explained at that time by the creation of the dragon. It also probable that large dinosaur fossils were discovered in the steep walls of gorges created by rivers. This would have given the ancients the impression that these creatures could FLY or that they connected heaven and earth. And maybe because these mysterious bones ( which were also greatly prized for their medicinal effects- adding still more to their aura) came to be connected in their minds with water and flooding, that people really started to believe in the existance of these creatures and even actually SAW then- in waves, in distant rainfall, in stormclouds, and most importantly in TORNADOs, which in both Japanese and Chinese are called Dragon Rolls ( Tatsumaki, 竜巻ーin Japanese), and also seem to form a connection between the earth and the heavens. It is not difficult to understand that, in these societies which depended on agriculture for their continued existence and which were at the mercy of the rivers, it came to be accepted that a person was deemed worthy of ruling as king by his ability be to control the waters- and by association- the dragons. Interestingly, in Mesapotamia, as illustrated by Babylonian mythology, the ruler attained his right to rule by SLAYING the dragon and keeping civilization safe from floods. This seems to have become the prototype for how The West would represent the dragon- as an evil creature which is slain by a national hero. 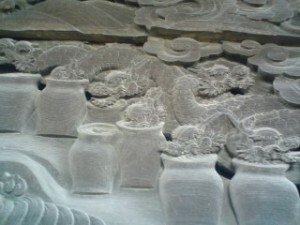 In China, however, instead of hatred, the water controlling dragon was looked upon with awe and reverence, The Chinese Emperors themselves came to connect themselves with dragons- whose image evolved over the years to become a highly symbolic composite of what was important for human livelihood-1) a horse, cow or camel-like face representing agriculture, a scaly body representing fishing, hawk-like claws representing hunting, and goat-horns representing livestock rearing. Anyway, over the centuries, China`s great artists worked with concept of the dragon to create sublime images of power, speed, and grace ( while some depictions are merely abstract geometrical patterns which are difficult to see as dragons at all ), as well as countless legends and stories. The dragon ( specifically, one with five claws) became closely associated with the Chinese Emperor, as well as with rivers, ponds, lakes, seas, and water in general. Dragons were also believe to be vehicles which carried various deities across the heavens. 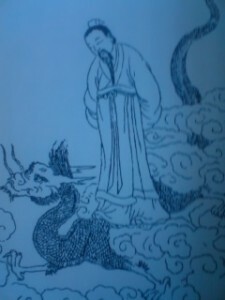 They also came to be important figures in Buddhist and Taoist thought. Later, artists, writers and thinkers in Japan were to make their valuable contributions to the development of this fascinating imaginary creature, as well. Just as dragons were not part of the consciousness of the hunter- gatherers of Europe, there is no evidence of dragon motifs having been used in pre-agricultural Japan. 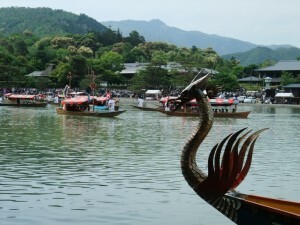 With the introduction of rice cultivation, however, and the subsequent dependance on irrigation systems during what has been dubbed the Yayoi Period ( 300 BC- 300 AD) it appears that ( based on patterns found on certain pots and ritual bells created at the time) dragons began to appear in the Japanese Archipelago ( as imports from China). And just as dragons ( or the slaying of dragons) had become associated with powerful rulers in various civilizations, it is in artifacts from what is called Japan`s Kofun Period (250-538), during which numerous local strongmen arose leaving behind burial mounds filled with funerary items ( KOFUN, after which the period is named), that unmistakeable dragon-motifs can be seen. ( I cannot proceed without mentioning the Japanese myth which most resembles a typical European DRAGON-SLAYING story- though the creature involved is not considered to be a dragon by the Japanese- but a giant eight headed serprent- the YAMATA OROCHI- which was cleverly slain by SUSANOO NO MIKOTO, the brother of the Sun Goddess AMATERASU with the use of eight vats full of Sake ( to sedate the beast) and a powerful sword. 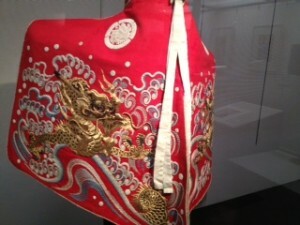 It is with the great infusion of Chinese culture and Buddhism, beginning in the sixth century, that the dragon really started to flourish in Japan ( in art ,architecture, stories, AND in the peoples minds). From India, the serpent-like water gods ( Nagas) which were an important part of the Hindu tradition, had been absorbed by Buddhism. And when that religion was introduced to China, they blended with Chinese tradition and transformed into dragon-like deities , which were then introduced to Japan as deities which control the rains ( RYU-OH) , who are also faithful protectors of the Buddha and Buddhism. 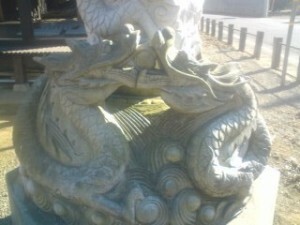 For this reason dragons became closely associated with RAIN INVOCATION CEREMONIES (AMAGOI,雨乞い) in Japan, and why water spouts at temples and shrines are often shaped like dragons . 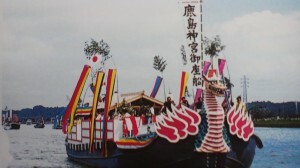 Because of this association with water, dragons were also an important motif for ships ( like Chinese dragon boats) and much later for fire-fighting equipment. 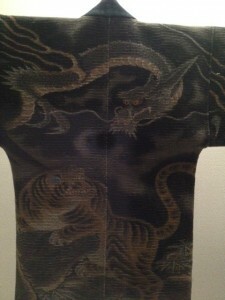 Firefighters even had the habit of tatooing themselves with dragons- a custom which was later taken on by the Yakuza . 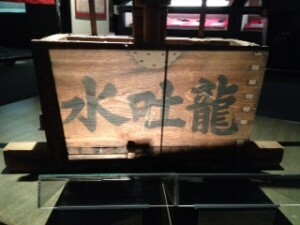 (Such tatoo designs were called KURIKARA MONMON （倶利伽羅紋々）, a word which now refers to a large dragon tatoo on the back, any full back tatoo, in fact- and the person who bears it as well. This expression derives from a buddhist story in which the deity FUDO-MYO-O battles an enemy who has tranformed into a sword. In response FUDO changes into a dragon and proceeds to swallow the sword. 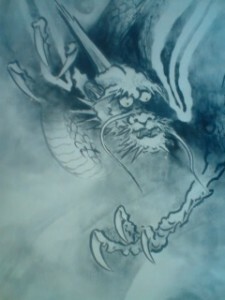 Sometimes images of FUDO show him with his sword being enwrapped in a dragon ( or snake) which is trying to swallow it). 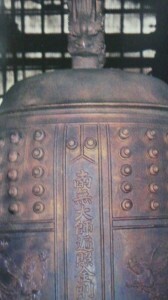 Dragons are also a common feature on the tops of bells which are such an important element of Buddhism. 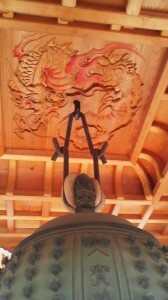 Often two dragons are joined together to form the ring from which the bell is hung. Two dragons swallowing a ball- this was the prescientific explanation for eclipses in the Chinese sphere of cultural influence. 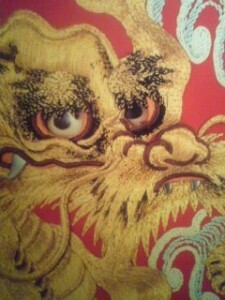 It is important to note that dragons in Asia are often portrayed holding balls ( DRAGON BALLS!) which they are said to love. 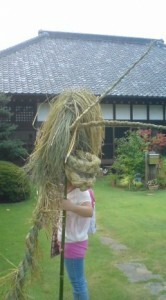 This photo was taken at Tsukuba`s Hachiryu Shrine. In fact, it is my opinion that the Japanese word KONRYU (建立) which is used as a verb meaning to establish a temple, originally must have meant- to set up dragons ( though the characters used now have a different meaning). 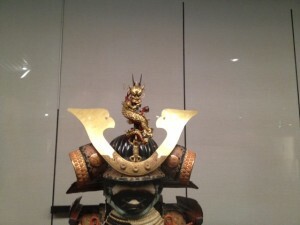 Because of the dragons awesome power and speed, and their LOYALTY in protecting Buddhism, it is only natural that warriors would want to have them on their helmets and armour. 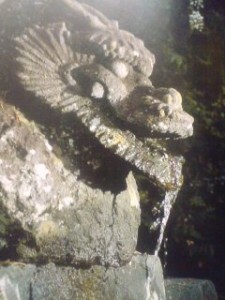 The Tokugawa Family ( which ruled over a mostly peaceful and unified Japan for more than 200 years) was especially fond of dragons and the temple/shrine complex at Nikko ( a World Heritage Site), in Tochigi Prefecture is replete with fantastic examples of dragon images. 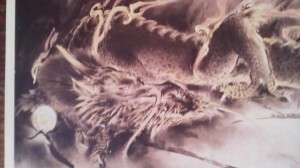 I have already told you that the dragon symbolizing the Chinese Emperor had FIVE CLAWS. 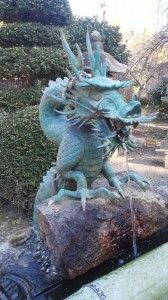 Most dragons found in Japan are humble and have only three or four. The great Tokugawa Ieyasu, however, the man who unified Japan after 1600 and founded the Tokugawa ( Edo) Shogunate had the confidence to have his dragons done with all FIVE CLAWS! Sorry………. this is going to take alot more time to finish! Got to wake up early tomorrow, so let me get back and write more tomorrow or someday in the future! But there is just one thing that I`d like you to remember ( and something you probably already realize if you`ve read this far)- that in Japan, traditionally, NOTHING is there merely for decoration or just for the fun of it. Every little motif used is pregnant with meaning and has a reason for being where it is. Now, if you see a dragon painting or sculpture, you will understand why it is there, or if you want to see one, you will have an easier time finding one! Or even better, you might loosen the constraints of reason which your modern education has bound you up tightly with- and you might even be able to at some moment, somewhere, recognize in the mist or in the shifting clouds- a familiar yet elusive figure – which was such a strong and REAL presence for our forebearere in these islands.